Happy Monday! Hope you all had a great weekend! My weekend was great! If you follow me on Instagram, you probably have an idea what I did this weekend. I took advantage of the 'spring-like' weather and checked out a new brunch spot with friends. Brunch is my favorite meal; so, I am always looking for the next great brunch spot. Hopeful I can share my favorite brunch spots in Baltimore soon for those in the DMV area or planning to visit. Today's look is all about simplicity. You can't go wrong with a black and white mix. 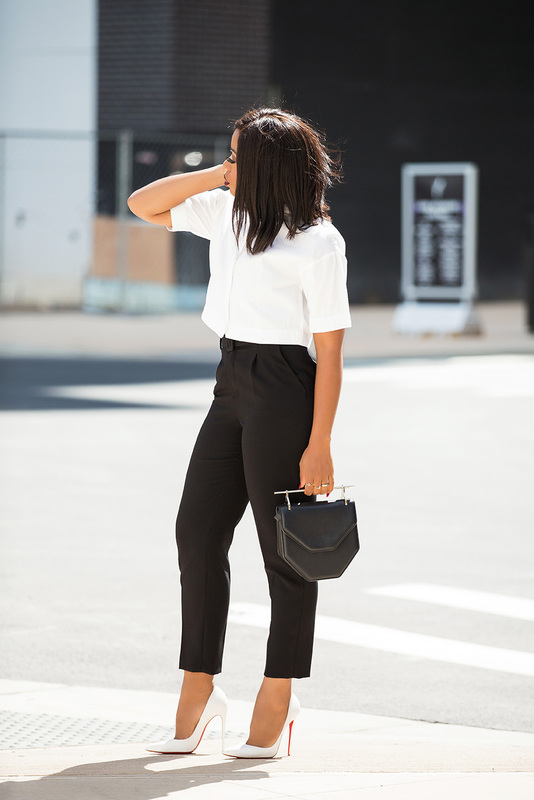 Black and white combination is always chic and classy. For this look, I wanted to showcase how to style a crop top in a classy approach that is suitable for work event. To style a crop top without showing off the midriff, simply pair it with high-waisted pants. The crop top should be long enough to meet the waistline of the high-waisted pants. To completed this look, I paired it with white pumps, which adds fun flare to the overall look. You can also substitute with black pumps as seen here with the same pants. I love your outfit. Coup de cœur pour tes escarpins.